There are millions of individual items in the collections, dating from the 12th century to the present day. For safe keeping and preservation, these are stored in environmentally-controlled conditions. Birmingham Archives and Heritage Service house outstanding archives collections including the Boulton & Watt papers, the Hardman archives, and other collections of local, national and international importance. For further details of the collections see our website page. To view this material you need to make an appointment by e-mailing archives.appointments@birmingham.gov.uk giving details of what you would like to view and when you would like to visit. Centenary Square, Broad Street, Birmingham, B1 2ND. If you wish to view original documents, you will need to have a County Archives Research Network (CARN) ticket. You can use a CARN ticket that has been issued by another record office. If you do not have one already, you will need to bring with you forms of identification that include your name, address and signature. In addition, use of some resources in Archives, Heritage and Photography require you to be a member of the Library of Birmingham. If you are not already a member, we can issue you with a card when you come to the Library. 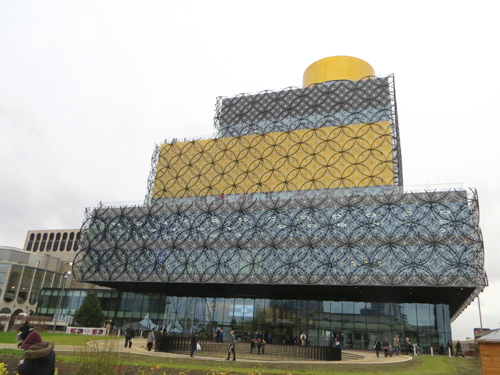 For the opening hours for the Wolfson Centre for Archival Research check the Library of Birmingham website. Parking: there is no parking available at the Library – public car parks can be found nearby at Cambridge Street and the NIA. Disabled parking: there are two bays for Blue Badge holders on Cambridge Street directly behind the Library on The REP side. Access to the front entrance is along the covered walkway on the east side of the Library leading onto Centenary Square. Further bays are available in the Paradise Circus multi-storey car park on Cambridge Street. Library Services - including books for loan and reference, study facilites, public computers, events and activities, library shop. Heritage research facilites for the study of local and community history, genealogy. Train: any trains to Birmingham city centre (New Street or Snow Hill stations). Bus: any buses to Birmingham city centre. Car/coach: all routes to city centre. The Library Café on the ground floor is open throughout the library opening times. It serves a range of quality eat-in and takeaway food and drinks. Dependent on research being undertaken.